I was never able to measure up in the ’80s when big hair was in. I have baby fine, straight hair. All my exertions with perms, hot hair dryers, roller brushes and sprays only emphasized my genetic shortcomings when it came to creating big hair. Fortunately, I don’t have to rely on my shallow gene pool to create an abundant look in the garden. 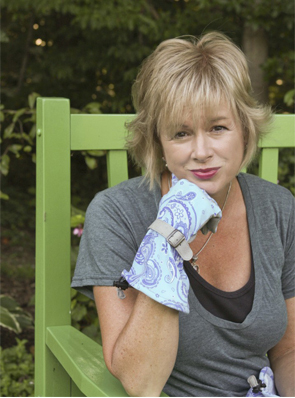 All I need is a good deal of compost, flowers and patience. Sometimes though, my garden seems to be a black hole. I can’t tell you how many truckloads of compost I had added to this hardpan Maryland clay soil. As for the flowers, I keep planting and planting to achieve the riotous abundant look I adore in the cottage garden magazines and books. Don’t get me wrong. The plants grow just fine, but there seems to be an endless amount of room for more shoving in of more plants. The problem is that it’s expensive to buy perennials in huge quantities, so I also try to start from seed, sometimes indoors and sometimes just direct seeding. And I don’t know what will bloom when around here until I live with it for a while. That means that I have to live with a flower for at least a year, maybe two, until I really get a sense of its habits and behaviors. The I have to engage in quite a lot of moving things about. Still…I think it’s worth it. See here. 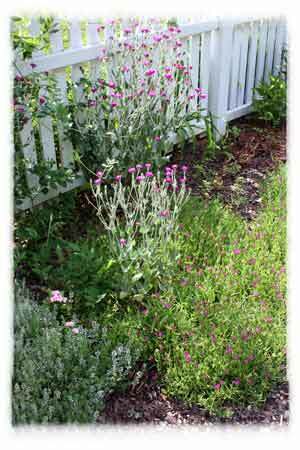 I didn’t mind weeding around the lavender in the cool hours this morning. The scent is glorious. 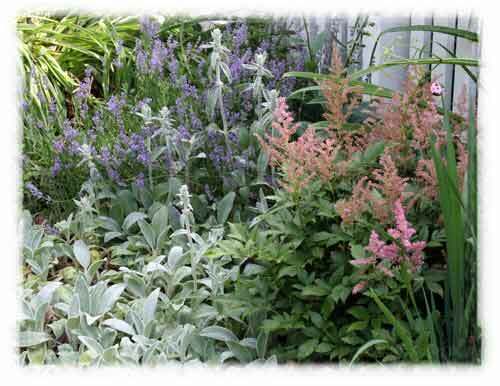 And I rather think it looks as if I had a plan when I put the lavender, astilbe and lamb’s ear together. In truth, I had no idea they would bloom at the same time. It was just serendipity. You would never know that this very bed used to be a swampy low spot in the yard that collected water after rains. Copious amounts of compost and deep digging solved that problem. And here. Although I complain about the rose campion, I do think it looks rather at home with the other pink flowers in this border. Serendipity again. 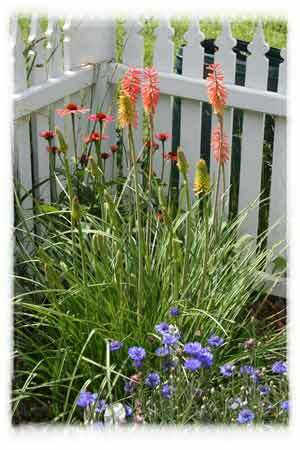 How about the orange cone flower and red hot poker? When I dragged the cone flower home from my local garden center I had no idea where I planned to put it. But the bald spot behind this red hot poker was just crying for a plant. I had no idea they would bloom together. We have a field behind our house that we call the Back Forty. We call it that because my husband and I grew up back in the day when most of the shows on televisions were westerns rather than reality shows. It seems that someone was always referring to the Back Forty. Well, I have my own problem with the Back Forty. It is most unlovely. And big. And I can see it from my carefully tended garden, which somewhat spoils the view. A friend who works in the county’s planning and zoning office sent this shot to me today. You can probably find something similar for your house on Google Earth, but this is a more recent shot than Google Earth has of our house. Still, it’s probably about three or four years old. The photo shows the magnitude of the problem. 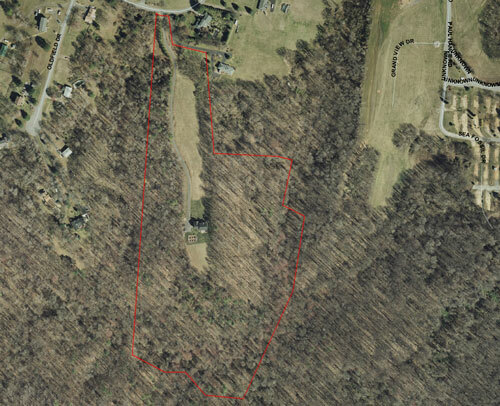 The red line indicates our property boundaries–about 21 acres. 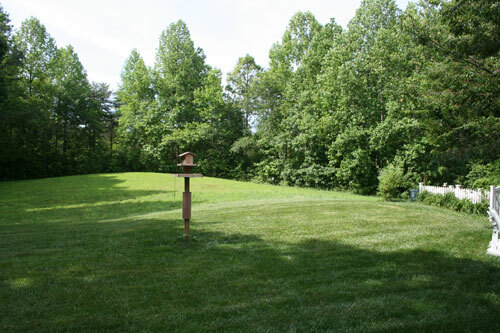 The cleared area is about five or six acres and our house/yard/garden is on about an acre of that. As you can see, the green patch is the yard. The line up the left hand side is our long driveway–the one we use as a running track. 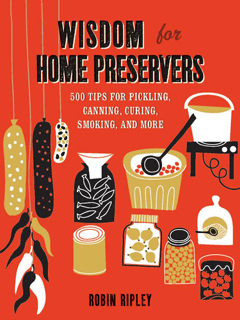 The rest is woods–tulip poplars, live oaks, gum trees, black locust and a bunch of others. The problem is that the Back Forty is fairly significant. You can see it at the lower side of the photo, south of the house and green lawn. This photo must have been taken in the winter or fall, because you can see the brown areas where hay has been cut and the grass is green. Only, get this. Farmer Rudy, the fellow who tends the field for the benefit of his cows, informed me about three years ago that I should start cutting the Back Forty myself. It’s too difficult for him to get back there with the equipment. I am putting together a list of things I can do with the Back Forty. It’s not flat, but rather slopes down at the sides and has some roll to it, particularly at the back, which you cannot even see in this photo. When my Papillons chase the deer back there, they disappear without even going into the woods. I have considered a meadow, but if you know anything about meadows, they are not easy to maintain. And I do not own farm equipment. Neither do I have the ambition to drive a tractor. I have also considered investing in some short-term help to put in a real crop, such as herbs, which can be harvested and sold. But I really don’t have the time for another business right now. I have also considered just adding some trees here or there. But I think I really need a grand plan before hopping on that scheme. What would you do? Any grand ideas?